The Majestic Theater, designed by C. Howard Crane, opened on April 1, 1915. The theater originally seated 1,651 people (at the time the largest theater in the world built for the purpose of showing movies), and the facade was designed in an arcaded Italian style. 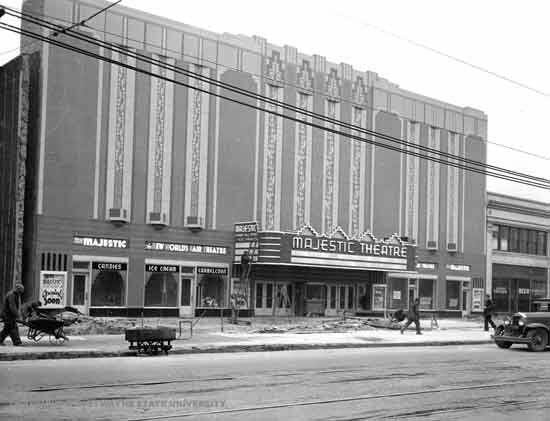 In 1934, the front 35 feet of the theater were removed when Woodward Avenue was widened to its present size. The entire facade was redesigned into its current striking Art Deco motif. The theater now boasts the largest enameled metal panel Art Deco facade in the Detroit metropolitan region. The theater eventually closed, and the building was used as a church for a time, and later as a photographic studio. It lay vacant for ten years. The present owner purchased the building in 1984.